An alternative route through limestone country to a little-used hut. Prebble Hill (902m) • By Matthew. Licence: C.
Cave Stream car park, SH73 West Coast Road. Broken River Hut is a tidy little hut on a sunny terrace overlooking Broken River. It is a bit out of the way, and doesn't see many visitors. Most that do make their way here come upstream from Avoca Homestead. Erosion on Broken River • By Matthew. Licence: C.
The route downstream crosses private land. Castle Hill Conservation Area includes much of Gorge and Prebble Hills on the true right banks of Broken River. Beyond here, you cross into private land occupied by neighbouring stations. 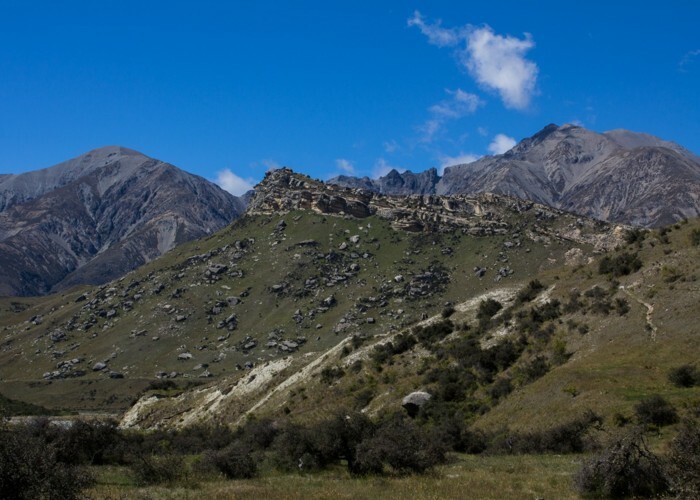 At Emu Stream, Korowai / Torlesse Tussocklands Park kicks off on the true right bank and leads all the way to the hut. Stop in at Flock Hill Station near Lake Pearson for permission and to sign forms. From the car park, follow the tourist track to the upper cave portal, and head down the dry stream bed. A vague track leads under a tumble of limestone blocks, down to Broken River. 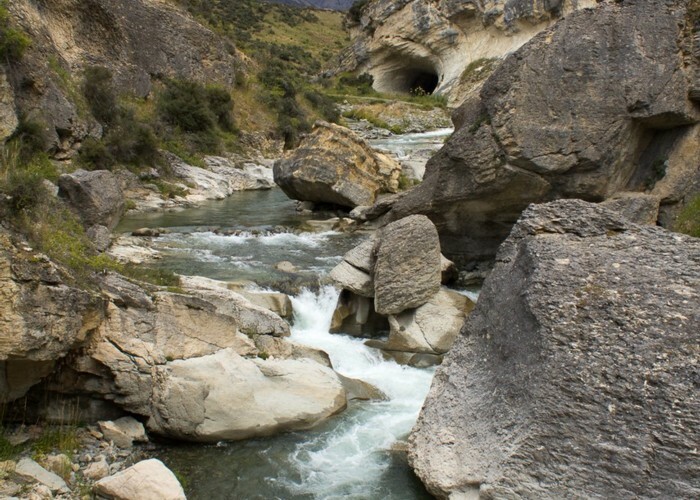 You can also start off from the lower portal, but the river directly below the cave is swift and dangerous. Broken River leads through a limestone gorge and soon opens out. Pass beneath Gorge Hill on easy river flats on the true right bank. 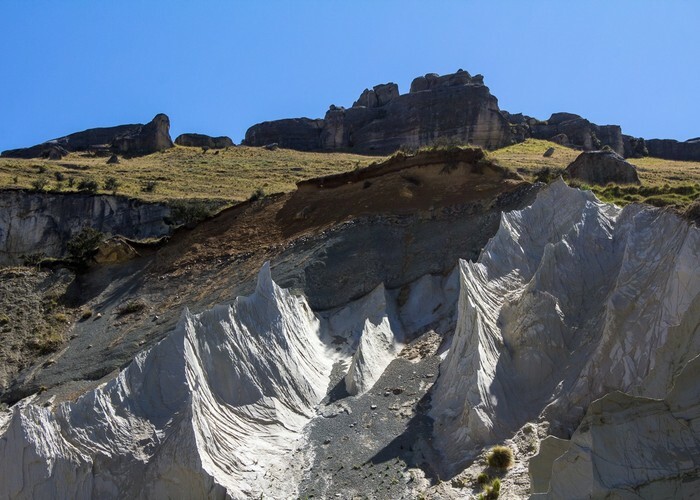 Across the river, cliff erosion has formed striking white pinnacles. Continue past the tilted limestone plateau of Prebble Hill and several large blocks tossed like dice. A fence across the river marks the private land boundary. Take the true left bank. The first gorge is just around the corner at Blackley Stream. Shattered-looking rocks lean in from both banks. At the bottom of the gorge is a deep corner. If a tramping track can have a crux move, then this is it. Returning back upstream, the swift, chest-deep flow could stop you here. Through the gorge, the landscape opens out with fences and the flats of Flock Hill Stream on the left. It is easy travel past a narrow outcrop and into another gorge section. Emu Stream enters at a rocky corner on the true right. At this point, the true right bank is public land all the way through to the hut. A winding gorge leads on to more straightforward river travel. Finally the view opens out with a vista of a blasted mine site on the hill ahead. Sidle past a low white cliff. Look for the weathered coal seam embedded in the Enys Formation layers. The tidy hut sits on the terrace above the cliff. Head downstream to a cairn then double back up an easy track through kanuka scrub. Cave Stream • By Matthew. Licence: C.
The hut has four bunks, table, open fire, store cupboard and toilet. There is a cut track behind the hut that leads up and over a series of grassy terraces with excellent views up Winding Creek and through to Purple Hill. Broken River Hut • Basic Hut/Bivvy (DOC). Capacity: 4. Added 18 February 2016 by MatthewMatthew. No revisions. 412 views in the past year (34 per month).